The offshore sector may face a significant decline in production if fresh capital is not urgently secured, according to an industry report. The Oil and Gas UK Business Outlook warns of a major drop-off in production from 2020 without the investment. It also forecasts a further fall in total capital investment for the next two years. 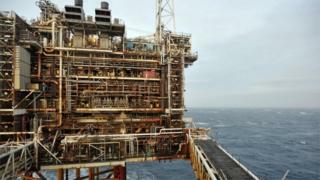 However, Oil and Gas UK said there were some signs of optimism as efficiencies push down the cost of producing oil. Chief executive Deirdre Michie said: "Confidence is slowly returning to the basin. "The revival is led chiefly by exploration and production companies which may collectively see a return to positive cash-flow for the first time since 2013, provided costs are kept under control and commodity prices hold. "However, this is unlikely to translate immediately into reinvestment or increased activity. "The challenges for the basin ahead, particularly for companies in the supply chain, are still considerable." The Business Outlook replaces the annual Activity Survey which provided an assessment of the state of the industry from some of its key players. It reveals that the average cost of producing a barrel of oil has halved from its highest level in 2014 to $15.30. Much of that cost reduction has come through job losses. Investment, against 2014 levels, has almost halved and exploration activity "remained depressed" with just 22 wells drilled in 2016. More positively, exploration and production companies are expected to return to profitable cash-flow as long as the oil price remains at about $55 per barrel. But there is a risk that the supply chain will come under further pressure unless new projects are sanctioned on time. The report said the oil and gas industry still supports 330,000 job across the UK but that number has not been revised as part of the business outlook. Energy Minister Paul Wheelhouse said: "The Business Outlook 2017 findings demonstrate that confidence is slowly improving within the sector, with encouraging improvements in both costs and productivity. "However it also highlights the challenges that still exist for the sector, in terms of falling investment, lower supply chain revenues, accelerating decommissioning, and record low levels of exploration and appraisal activity. "We are conscious of pressures that are being felt within the supply chain and that while there may be some encouraging signs it may be some time before there is a significant upturn in investment in exploration and new developments, without urgent, targeted support."